Proximity Sensors, Magnetic Switches, and Proximity Switches Custom Manufactured by Rapid Sensors, Inc. Magnetic reed switch sensors are reliable, ultra-long life performers when made with our 1st World manufacturing disciplines. (Usual life is over 100+ million operations when appropriately matched to your electrical load.) They can be actuated at very large sensing air-gaps by large discrete permanent magnets and do not require standby power-drain while in active sense mode. 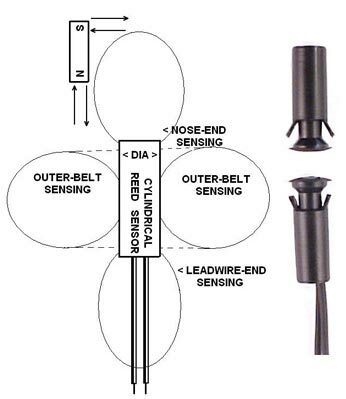 (Alternately, we offer unique steel proximity-actuated sensors with these desirable characteristics on other pages of this site). Reed sensors are excellent for logic signal loads up to 20 milli-Amperes but can operate under moderate power loads such as relay coil loads up to 200 milli-Amperes with a life of over 10+ million operations if molded with protective components internal within our sensor. Contact factory for heavy loads up to 2 Amps. We select and supply appropriate actuator magnets with special molded or machined housings. Our sensor designs typically include terminations and design features to aid assembly and reduce installed parts count with features such as the self-fastening snap-fit fingers in the photo (or special mounting flanges, risers or mounting lugs.) Our RAPID PRODUCTION TOOLING IS USUALLY NO-CHARGE for new customers.